Here is a unique infant boy gift built around a cute barnyard animals theme. 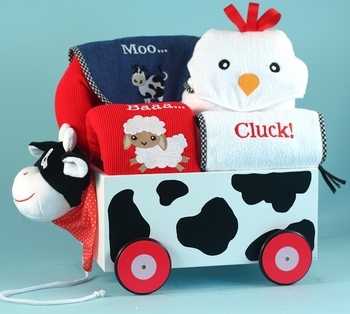 All babies love farm animals and this design includes premium coordinated layette items nestled in a custom hand painted wagon they can use to pull their toys around! The cute wooden wagon is sturdy for many years of play and comes artfully hand painted, complete with a plush head, neck scarf and a little tail made of fabric. It measures a generous 22 inches long by 11 inches wide and is fully compliant with all US consumer product safety requirements*. Inside the wagon, the new baby�s mom will find a cute array of coordinating necessities she is sure to use a lot! The coordinated blanket, bath towel, bib, shirt and washcloth fabrics are all premium quality and made in America from only high quality US grown cotton for longevity and softness. This is a gift sure to impress and certain to get a lot of use from both mom and baby! Once complete, the entire gift set is wrapped in clear tulle for a lovely presentation! *Adult supervision is recommended for children under 3 years of age. This wagon was a hit for our friends. They said that the bath towel and blanket were very soft and sure to be favorites as their little boy grows up.